"I Wanted to Give Jasmine Her Dream Wedding"
Gabriel Sheffield and Jasmine Harris must be one of Virginia's luckiest couples. 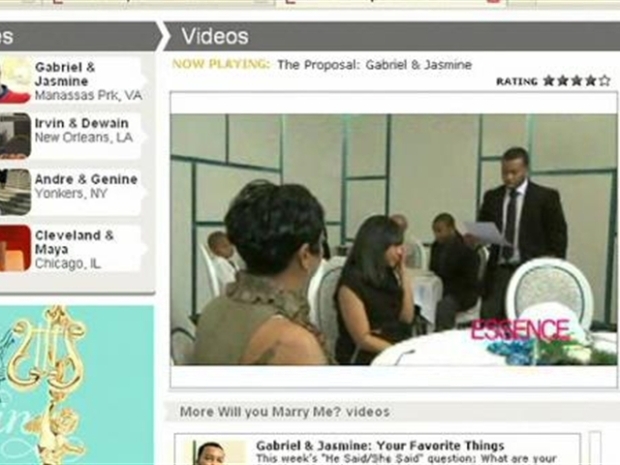 Besides the fact that they are head-over-heels in love, the local Manassas Park, Va. couple managed to beat thousands of other couples to win Essence Magazine's 2010 "Will You Marry Me?" Contest. The couple got the big news in NYC on Friday on a national television show. Harris says they had been waiting for the news for six weeks. "We are so excited that we actually won -- there are so many different emotions... all the pressuring people for votes actually worked! " she said. A wedding consultation with renowned wedding producer and designer Diann Valentine. A wedding dress from the David Tutera by Faviana Collection, designed collaboratively by design house Faviana and celebrity wedding planner David Tutera. A cake from one of the bakers featured on the WE TV show "Amazing Wedding Cakes." And that's not all. The winning couple also gets to fly away to a fantasy honeymoon in Maui for six nights in two luxurious resorts, romantic dinners, spa treatments and more. "It feels pretty good that everyone voted for us because I wanted to give Jasmine her dream wedding... it's not really for me, it's for her," said Sheffield. The couple kicked off their Valentine's Day weekend with the great news, and was even recognized by a New York City cab driver. "We were waiting outside of our hotel and we were about to get into a cab when another cab driver rushed in to get us first," Harris said. "He told us he had to pick up his favorite TV couple." Harris and Sheffield, however, are anything but just a TV couple. "I appreciate Essence Magazine for allowing me to propose to Jasmine in front of the world... this reality has become a dream," Sheffield said. The couple plans to marry in Baton Rouge, La. in May 2011.